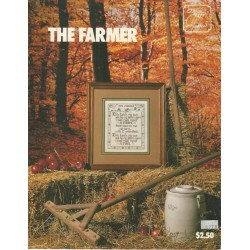 Vintage and discontinued cross stitch patterns for your stitching needs. Even a few stitching kits. Make something beautiful for yourself or your home with these designs! Cross Stitch There are 74 products. Leisure Arts cross stitch No. 607 pattern booklet. 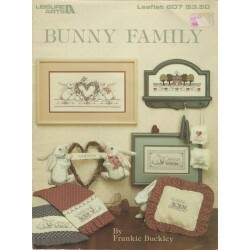 Bunny Family by Frankie Buckley. Full of the cutest bunny rabbits. You can embroider pictures or different motifs for pillows, napkins, towels and more. Perfect patterns for any project, limited by only your imagination. 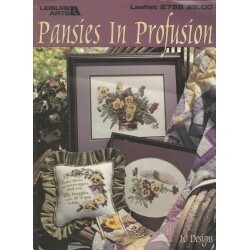 This is a nice, vintage cross stitch pattern book from Leisure Arts! 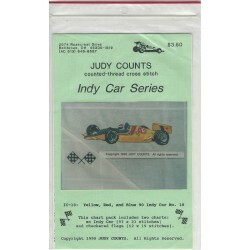 Judy Counts Indy Car Series No. 18. 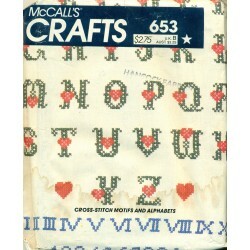 Great cross stitch patterns to embroider. Includes two charts. One for an Indy car. The other for checkered flags. Bonus chart for Bobby Rahl. Vintage, cross stitch patterns from the 1990's and Judy Counts. 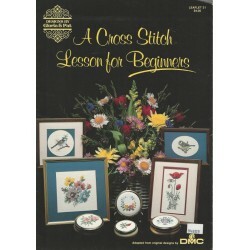 Three Needles cross stitch pattern booklet. The Farmer. A nice saying which can be stitched as a picture or more. It would also make a nice saying for a quilt block, pillow or whatever you can imagine. Companion to The Farmer's Wife, also by Three Needles. 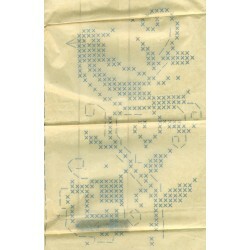 A nice, vintage cross stitch pattern from Three Needles! Designs by Gloria and Pat for beginners. No. 21, A Cross Stitch Lesson for Beginners. Vintage, from the 1980s. Besides instructions, there are 12 nice patterns for you to stitch. Create nice, simple pictures for your home. Even pretty motifs for bags, pillows and more with these patterns. 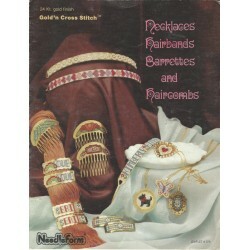 A nice, vintage cross stitch booklet from Designs by Gloria and Pat! Cross stitch crib cover Kit No. 40598 from Bucilla and Daisy Kingdom. Cute Honey Bunnies pattern with bear and toys. Create something warm and cozy to wrap the little one in your life in. Pre-quilted and bound. Completely washable and easy to care for. Discontinued from 1991. This is a nice crib cover or baby blanket from Bucilla and Daisy Kingdom! 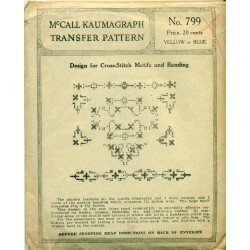 McCall Kaumagraph Transfer Pattern, No. 799. Perfect hand embroidery design to add a wonderful, antique flavor to your embroidery and handwork project. Includes a large motif which is 10-1/2in. x 6-1/2in. (26.67cm x 16.51cm), 1-1/4in. (3.175cm) wide band and four corners. Cross-stitch with additional floral design. Discontinued embroidery kit from Bucilla. Charming Christmas tree skirt which is 42in. around. Santa Claus (Kris Kringle) and Christmas trees on a white background. Counted cross stitch embroidery. 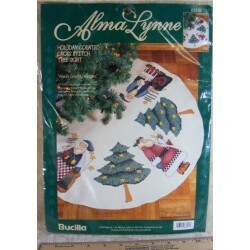 You can craft a very nice addition to your holiday traditions with this discontinued kit from Bucilla. Transfer patterns from McCalls, No. 653. Cross stitch iron-on transfers. Great for hand embroidery. 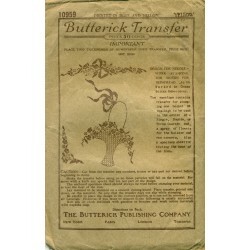 These transfers include an alphabet with heart motif, cute little duck pattern, floral and Pennsylvania Dutch style motifs. Three full sheets of iron-on transfers with a bit of vintage flair and charm! Nice, vintage item from McCalls. Leisure Arts cross stitch No. 593. 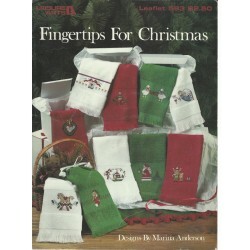 Fingertips for Christmas, designed by Marina Anderson. The cute holiday designs are made for hand towels. But, you could use them to embroider designs for other holiday decorations. Even could be used to create nice Christmas gifts. 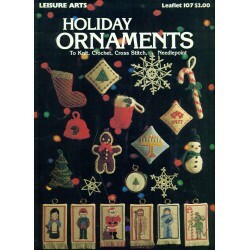 A nice, vintage cross stitch pattern book from Leisure Arts and the 1980's! Needleform cross stitch No. 976. Gold'n Cross Stitch. Necklaces, hairbands, barrettes and haircombs. Even has instructions for cross stitch beading. You can embroidery pretty and fun accessories with these motifs. These would make very nice gifts. 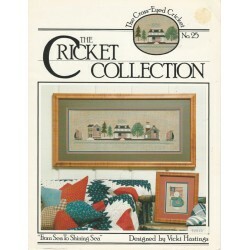 Nice, vintage cross stitch patterns from Needleform and the 1980's! 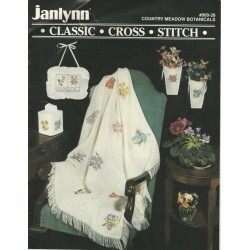 Janlynn cross stitch floral patterns. No. 900-28, Country Meadow Botanicals booklet. 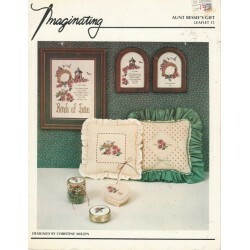 This instruction book has several beautiful floral patterns you can cross stitch for your next project. Roses, hydrangeas, lilies, quince, delphinium are just some of the flower patterns. Discontinued, this is a nice pattern book from Janlynn! 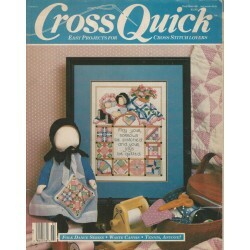 Cross Quick magazine with cross stitch patterns. Feb/March 1989 issue. Lots of projects you can make. Plenty of patterns to add to your pattern collection. Tips and information to help you too. 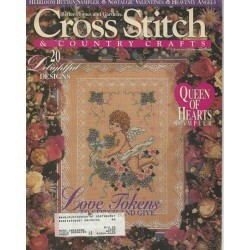 Plenty of ideas and cross stitch patterns are included in this issue of Cross Quick magazine! Cross Stitch Magazine with patterns from the 90s! From Better Homes and Gardens. This issue has cute and pretty Valentine Day themed patterns. Like Queen of Hearts sampler, Love Tokens and actual valentines. Even has non-Valentine Day patterns for all year round fun. 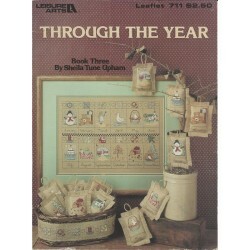 Several different and nostalgic designs are in this issue of Cross Stitch Magazine!